THIS POST IS GOING TO BE A LITTLE BLOODY AND GRAPHIC AND WILL DEPICT PHOTOS OF ANIMALS BEING SLAUGHTERED. PLEASE DO NOT SCROLL DOWN IF YOU ARE SENSITIVE TO THIS TYPE OF MATERIAL. If you read my previous post, you probably know that I spent Eid with my friend Sara. You also probably know that people slaughter animals in remembrance of prophet Abraham. I’m going to talk about what happens when we sacrifice these animals. This is like my 3rd Eid but I am a revert which means I don’t have any Muslim family members, and it means that born Muslims like to “other” me so I haven’t actually been invited to any Eid events. (on a semi-related note, did you know that 7 out of 10 new converts leave Islam, mostly due to how terrible born Muslims treat them? This is a serious issue. Get it together, born Muslims.) 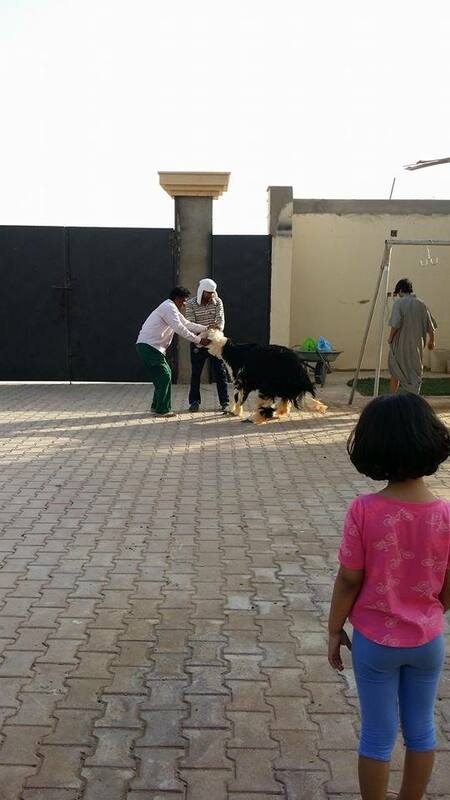 Because I had never been to an official Eid, I have never seen an animal be slaughtered. I really didn’t know how I would react to it, and thought that maybe I’d freak out a little bit. But why would I freak out? I eat meat all the time. This is what happens when we eat meat. Animals die. It is a normal part of my daily life, so I shouldn’t freak out watching it happen, right? And they are kind to the animals when they kill them. They separated the animals during the slaughter so they didn’t have to watch their friends die. They prayed over the animals and offered them to God, so that makes it better, right? He won’t have to see his friends die. It’s so normalized here, even the children watch it. The men started by separating the sheep, which was actually really funny. They had a hard time getting the sheep separated, and getting them to a place where they couldn’t observe the slaughter. 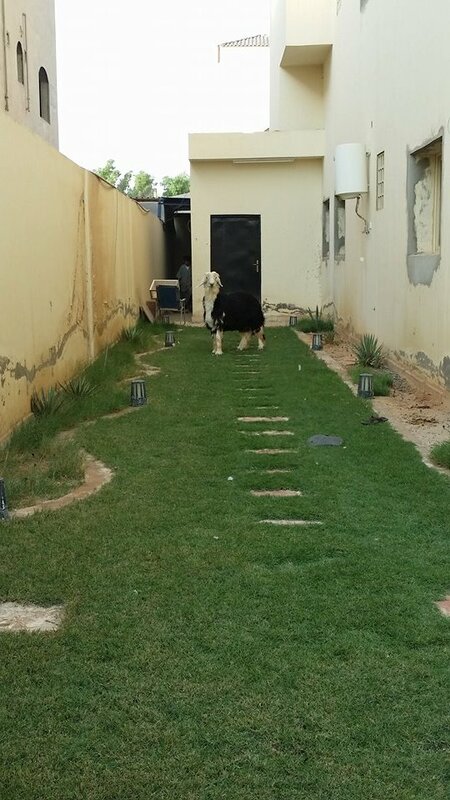 When they finally caught the sheep, it would stub up and refuse to move. 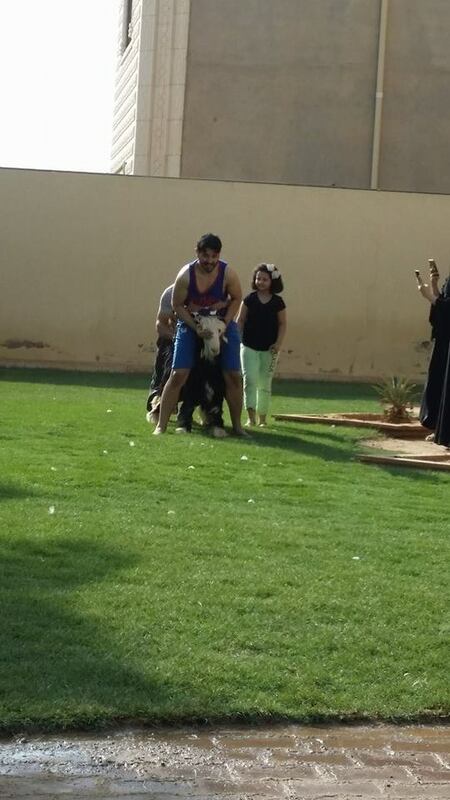 It’s really funny when you watch a grown man trying to ride a sheep. Whenever they slaughter the sheep it isn’t funny though. It was a little disturbing to watch at first, but it wasn’t as bad as I thought. HERE IS WHERE THINGS GET GRAPHIC. 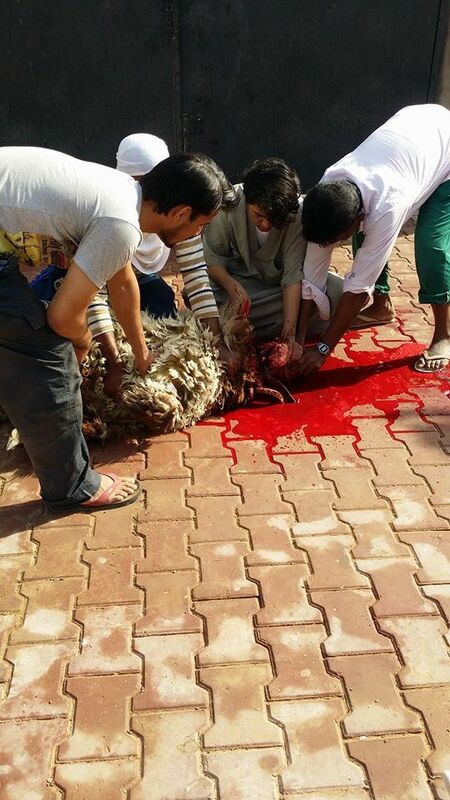 They kill them by making one quick cut across their throat and letting them bleed out. 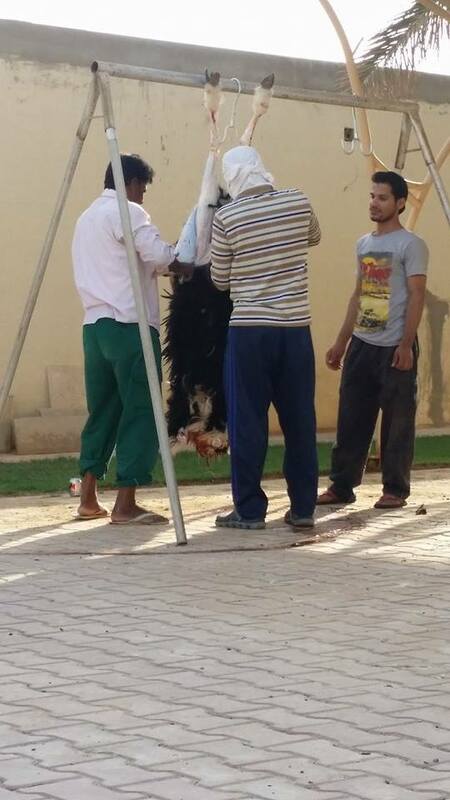 They wait to make sure they are totally dead before they hang them up to remove the skin and meat. I told you it was gory. The cool thing was that it was kind of a family effort though. Yeah, the men were the ones who actually moved the sheep and slaughtered the sheep and got them on the meat hooks. 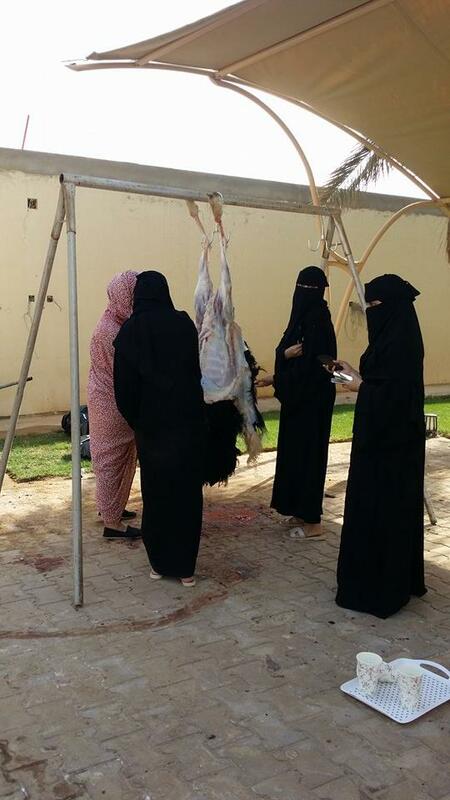 But after the animal had been killed, the women took over and did just as much work. They butchered the animals and separated the meats and packaged them appropriately. 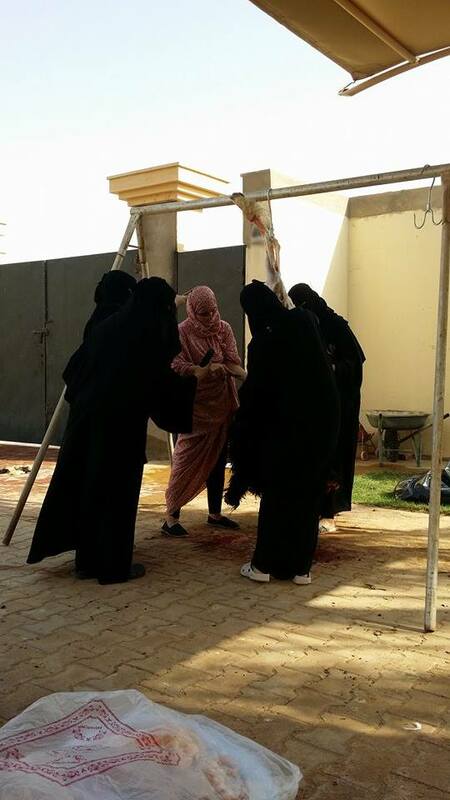 That’s not even the most impressive thing- they did it all while wearing niqab! No time was wasted, either. As soon as the meat was ready, the cooking began. 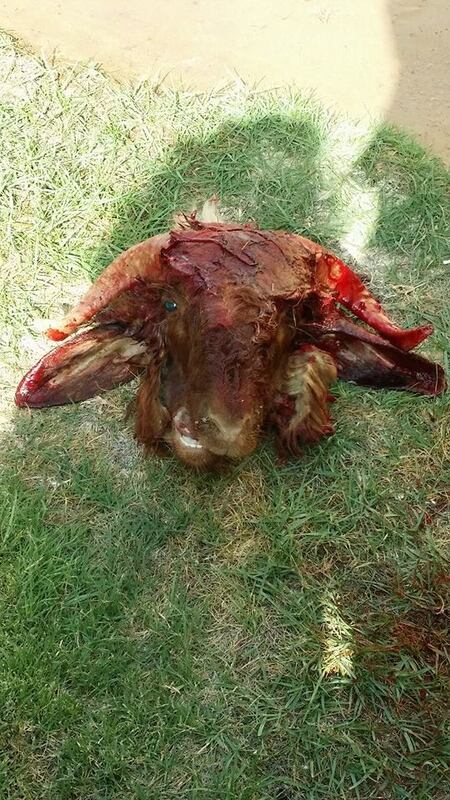 I will post photos of cooked food in a separate blog, but in the spirit of being gory, I will leave you with a photo of a severed sheep head. Mashaallah, he had gorgeous horns.